The above price assumes pick up in Inverness on the first day and ferry travel to Orkney with the group leader. If you choose to fly direct to and from Kirkwall the price is reduced by £25. Our departure day will involve taking the ferry back to John O' Groats then driving back to Inverness. We will arrive back at Inverness train station at approximately 4pm. This holiday starts and ends in Inverness. Your guide will meet you at the entrance to Inverness railway station at 1.30pm where you will join the rest of the group for the drive up to John o' Groats and the ferry to Orkney. If you prefer you can fly to Orkney instead. Flybe offer direct flights to Kirkwall from Edinburgh, Glasgow, Aberdeen and Inverness. www.loganair.co.uk - Edinburgh, Glasgow, Inverness, Aberdeen. *We will be staying in comfortable guest houses in or near Kirkwall, Orkney's attractive little capital. All rooms will have ensuite or private bathrooms. We usually manage to accommodate the entire group in the same guest house on this trip, but occasionally we may have to split the party up between several guest houses. However, we will be dining together each evening in local restaurants so there will be plenty of opportunities for socialising with the rest of the group. Easy / Moderate. The walking on Orkney is generally easier than that on our other island holidays. Distances each day are generally modest (usually about 5 - 6 miles) and the terrain tends not to be as rough as that found on many Hebridean islands. We will be walking for around 4 - 5 hours each day but the pace will be gentle, with lots of opportunites for photographs, wildlife watching or just admiring the gorgeous Orkney scenery. You will, however, need a basic level of fitness, be used to walking on uneven ground and be capable of some sections of uphill. 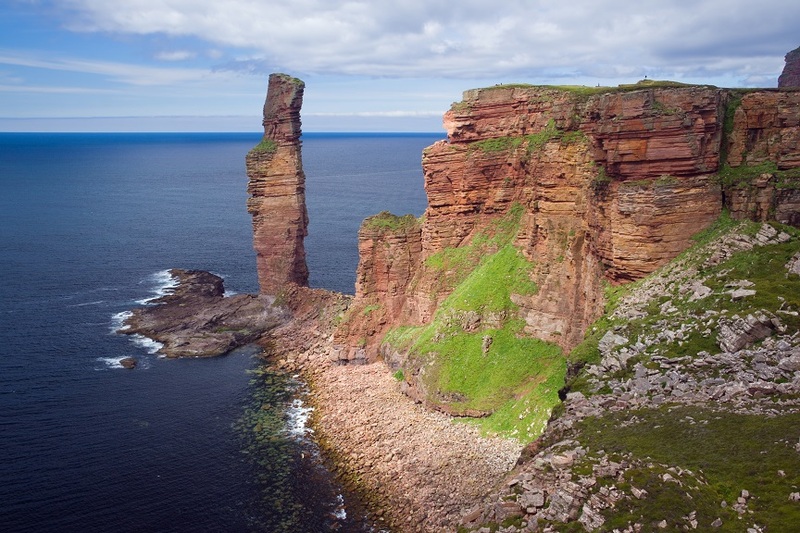 The walk to the Old Man of Hoy, for example, follows a good path but does involve about 200m (650ft) of ascent. I was one of a group of 8 who visited Orkney this July with John Groom. We gelled very quickly, we all looked after each other & I was thus able to get over the challenging stiles that we encountered on our first walk. We enjoyed beautiful cliff walks, amazing archaeology & lots of close up flora & fauna. The accomodation in Kirkwall at "BellaVista" was very homely & we were well looked after. Evening meals were varied & all good.Having booked the holiday in deepest winter I felt that I had invested a lot emotionally . It did not disappoint. A wonderful trip highlighting the very different island landscapes. Mick, our guide, had everything timed to perfection which meant we could relax and enjoy the walks to the full. There was never a dull moment. This was my third Hidden Hebrides holiday and I am already considering the options for number four. My Second trip with Hidden Hebrides. Mick is very experienced in general knowledge of the area - geology, birds, wild flowers, history and archaeology - very well organised trip, excellent accommodation. Well chosen quality restaurants for evening meal. With enough time taken for photos and being in awe of such sea and land scapes. Great inland and coastal walks, white sandy beaches, to suit all levels of walkers. Exceptional week away and meeting new people from being picked up at Inverness train stn to being dropped off. Wonderful. Having been bowled over by the Hidden Hebrides Highlights last year I returned with friends for the Orkney tour last week. I hadn't realised how much there was to see and do, but Mick's planning was meticulous as always and we managed to walk, spot birds & flowers, visit 3 other islands and see many of the major ancient sites. The B&B we were booked into (Bellavista) was very comfortable and we ate in a different restaurant every night, all of them being excellent. I can't recommend these holidays highly enough. Apart from the weather, which was dry but absolutely freezing, I couldn't fault it. This was my first trip to the Orkneys and I could not have found a better company to introduce them to me. We explore 3 islands plus the 'mainland' itself. We went on several walks, the longest of which was about 3 hours. There was a variety of scenery and wildlife especially the seabirds. We also visited some of the key archaeological Neolithic sites which were fascinating. We stayed in B&Bs which were universally excellent and a of a higher standard, in my opinion, than those found in England. We ate together as a group in local restaurants whose standards exceeded my expectations. Mick, our leader and owner of the company was an excellent and very knowledgeable guide. I am already planning another trip with this company. A fantastic holiday, well led and organised by Mick, which provided a wonderful combination of walking, natural beauty, and fascinating archeology. Add to that comfortable accomodation, good food and company. We could relax and enjoy a most varied and interesting trip, carefully planned so that we got the best out of our short visit to these beautiful islands. Our base for the week was in Kirkwall and our day started with one of Patsy's excellent Orkney breakfasts. We visited many of the islands each containing unique archeological sites. A huge variety of sea birds and one day Mick took us to a spot where he thought we may be lucky enough to find the Scottish Primrose which is one of the UK's rarest flowers ... And we did! Mick our leader was good humoured, unflappable, flexible, thoughtful and considerate. All in all a most enjoyable and rewarding week. This was my first visit to the Orkneys, which I was attracted to as it included day trips to the islands of Westray and Rousay as well as exploring the better known sites on Mainland. Mick was an excellent tour leader who took us to sites that some other visitors may never see. Brilliant organisation by Mick. The walks, the scenery, the archeological sites were all amazing The food was amazing Highly recommend this trip. The Orkney trip was really well organised, Mick Blunt's depth of knowledge and interest in subject matter, from geology, birds and fauna to histories, ancient peoples and local customs was fabulous. Plus the accomodation and meals were more than satisfactory. All was much better described than in the brochure! I would certainly recommend this holiday.